Facebook has grown from the thirst to meet up with old acquaintances, but it’s recently been strongly criticised. I started using it with my eyes open. I knew that security was flaky. When the last set of security changes came through, I saw a surprising number of technically savvy users destroying their Facebook accounts. Made me think again. My first reaction was to also commit Web 2 Suicide (i.e. destroy my Facebook account). Mainly because I couldn’t form a good enough opinion of what on earth was going on. The permissions and security interface is hard to navigate, appears to be deliberately confusing and I simply didn’t understand it. I persevered and eventually got a basic map of it. Armed with that I realised that it would be possible to live with Facebook, provided I kept alert and put in extra work. To assist others going down that same road, I’ve included that map and some brief notes. This isn’t literature or journalism, it’s technical notes. Update: 2010-06-01. People can get hold of your information via the legal system. I’ve called it Subpoena Leaks. A judge needs to be convinced that a fishing expedition is a good idea. I think Facebook is a good and necessary experiment. We don’t know what works and what doesn’t in this evolving Internet world. Zuckerberg has retained control over it, in part by not offering you any paid services. This enables him to do things which we (as users) can’t even imagine, the sort of things that can bring real improvement into the world. He’s using that and in the process helping a lot of people better understand what does and doesn’t work. I applaud the guts it takes to do that. However his attitude to Facebook users makes me concerned (profanity beware). There’s a lot of ways information can get out of Facebook. Some of them are sketched below. Acquaintances. Acquaintances are what Facebook calls friends. This is the most obvious of the privacy areas, but there’s a few more as you can see from the number of coloured sectors above. There’s a wealth of tools to manage these. Some are hard to find but they’re there. You can limit visibility down to individuals or the groups you yourself define. (You can also exclude individuals or groups.) It’s quite precise if you want. The Individual and Group settings (at this writing) are hidden away under customize, where you also find the setting to keep that particular information to yourself. If you want an idea of what anybody can capture from some Facebook data with a little effort, look at Pete Warden’s post on the subject. Acquaintances of Acquaintances (AoA). A lot of things can get published to this group, if you choose. It’s a good idea to get an appreciation of how many they are and what you know about them. If each of your acquaintances has between 10 and 300 acquaintances, who you haven’t friended, that could be a lot. It could pan out between 100 and 90 000 people, that are not in your own friend list. Applications (Apps) are an interesting one. I don’t know how many people use them, I personally tend to keep them disabled until needed. Traditionally Apps have been able to download just about everything that you have stored on Facebook. Formerly they were only allowed to hold onto the data for 24 hours before dumping it. It’s reported that many Apps just stored the data indefinitely. (From a practical point of view that makes a lot of sense.) The new rule from Facebook is that App operators can hold onto data (no longer limited to a day!). That’s a lot of data that they get. Some of which might even be hidden from your Friends. There is a new programming interface (May 2010) and new features that enable Apps to easily get the parts of the data that they really need. From June 2010 I imagine that the promiscuous availability of your data will progressively diminish. The safest way to limit applications is to deny them access altogether, if you want some access there’s finer grained controls. 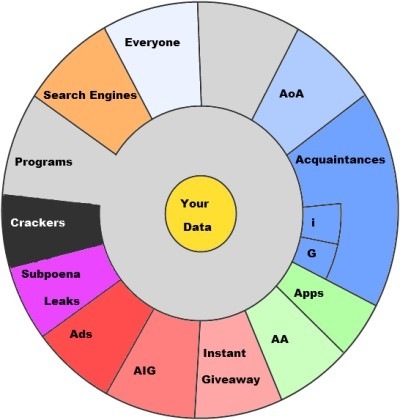 Application of Acquaintances (AA) is data that gets out via your Friends using an application. Not something I expected to see but it’s there! Other applications can get your name, picture and public biography just because you’re on a friend list, but this goes further. This could be thousands or tens of thousands of people (you’ve never met) sharing information about you with application companies, just because they’re Friends of Friends. You can control this in that user interface. Instant Giveaway / Instant Personalisation and AIG / Acquaintances Instant Personalisation was recently introduced. It’s a way for selected partners to get your information on Facebook immediately you land on their site. At launch there are three such partners. One of them only operates in the United States. I find this idea creepy and want out of it, until I’ve seen how it pans out. It’s easy to turn off your own giveaway, but acquaintances giving away your details, through this route, is harder. You need to turn off each individual service that uses this by banning it. That’s harsh to these services, but it’s the only option offered. Advertisements (Ads), if I guess right, don’t get information through the same API that others use to get your data. They are picked by a Facebook advertising engine that has direct access to everything. So if you hide your age, they can still target adverts at your age group. This is part of how Facebook makes money and keeps going, so it’s understandable. There are opportunities to dig out hidden information, if the advertiser wants, so it’s potentially open to abuse. (Facebook has been giving your ID to advertisers for some time. From this they can get your name, picture and other details, in milliseconds.) Currently you have no other control than to have nothing there in the first place. Subpoena Leaks, another way all your information can be released is by court action. Over two years of data including that from Facebook was released through the legal system in a Colorado court case where injured people were suing Wal-Mart. I haven’t examined the details but this is also something to bear in mind. Not only can some government employees get to peruse what you’ve done on Facebook but others can too. Crackers (often called hackers in the popular press) have in the past been able to grab a lot of information. An exploration of the Facebook interface will show an alert user places where the system is weak and the bad guys might be able to get in. I wouldn’t be surprised if everything you have on Facebook is being siphoned off by unsavoury characters. Programming. You can see what programs can access through applications like Facebook Mirror, or go in yourself and see what is revealed by the programmer interfaces. To wrap up, there’s several ways that your data (like your profile) is shown to others. There are ways to control this but it takes some work. It also changes every few months so you need to repeat from time to time. If you object to how it works you can always delete part of what you’ve already published. Facebook, it seems, isn’t going to help you understand this. You need to find out for yourself. If Facebook’s value to you exceeds this effort there’s no need to delete your account. This is the result of some online research and my best guess as to what’s going on. I didn’t want to research it myself, but found no option! I haven’t validated it all thoroughly. Caveat Emptor. If you’re using it for things that matter to you check your facts first, they change often. Mike Gale. If only I had a dime for every time I came here… Amazing post! Don’t get too close to Facebook. Trim down what you have on your profile. Be vigilant.